I have a lady that comes to me for acrylics who suffers from watering eyes so finds mascara a difficult thing to wear, even waterproof versions. She recently had her make up done professionally for an event and the woman commented how long her lashes are naturally but like most of us they're basically blonde at the tips and this is why lash tinting is such a good idea. It's perfect for anyone who swims regular or can't use mascara or even perhaps someone that doesn't like to wear make up. Here's a before and after photo and you can really see the difference..
You should always have a tint test first at least 24 hours before the service. Alot of people don't like to do this as they just want it done and dusted but afterall, this is your eyes we're talking about, you only get one set so they need to be looked after. 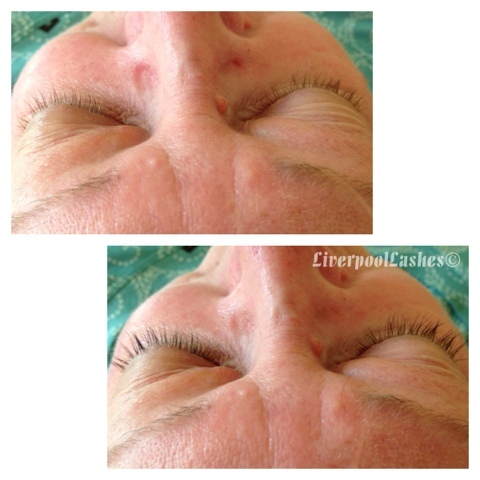 If you have had your lashes tinted it is best to avoid any oil based products to prolong the result.